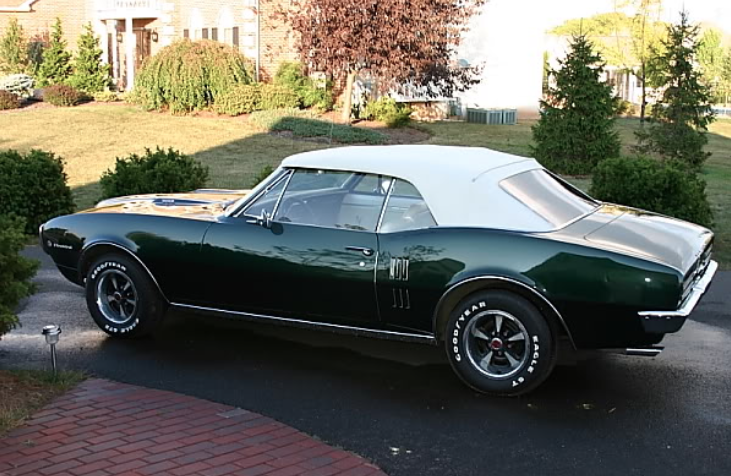 Someday the last barrel of crude oil will be extracted from the ground and my 1967 Firebird will become a static display. That's the problem with finite resources. The same is true for the Hamilton Electric movements. Electric movements involve parts that were meant to wear over time, like brake pads on a car. Those parts are no longer made and eventually the few that remain will be exhausted. Then what do you do? Maybe make alternative parts? One option is to replace the Electric movement with a mechanical calibre of the same dimensions. There's a lot involved in that but I'll show you how that can be done. There are 74 unique catalogued Electric models that use the 500, 500A or 505 movements. Several of the models are very popular asymmetric models but many of the Electric models are less exciting and often become donors for parts needed by the more popular models. It's a dog eat dog world when it comes to Electrics. One of the first Electrics was also one of the most popular... the Ventura I. Typically the Ventura I is just referred to as the Ventura. I wonder if there were plans for a Ventura that was an automatic, sort of like how the 1961 Pacermatic (Pacer A) was modeled on the 1958 Pacer. In any event, the Ventura never came with a non-Electric movement but if the Pacer can have one then logic would presume that the Ventura could too. 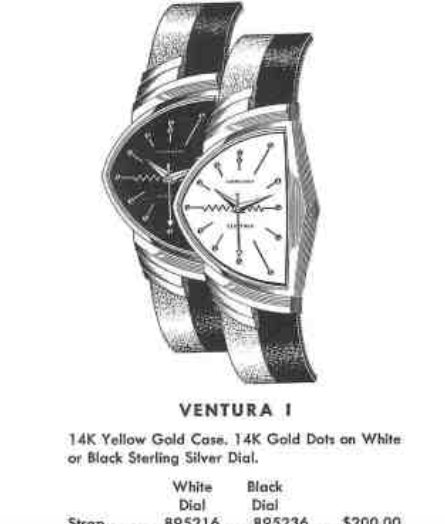 There is a non-cataloged model called the Ventura II. It's a solid 14K version of the Pacer case but with the Ventura dial and it was made specifically for presentations, mainly for GE, Kraft and a company called Sanders & Thomas. I have also seen it referred to as the Pacer II... that may depend on which dial is inside, triangular markers for the Pacer or round markers for the Ventura. The Ventura is a very popular model and was offered in solid 14K white or yellow gold and eventually with diamonds on the dial too. It is not a rare watch and is easy to find. However, the challenge can be to find one with a nice crisp case that hasn't been over polished. There also are some 18K solid yellow and rose gold examples that were made specifically for export. They are much less common and can sell for upwards of $20,000! If you have deep pockets you could assemble quite a collection of different Venturas in both white and black dials, with and without diamonds, in 14K and 18K gold. I was recently contacted by a friend who wanted to convert one of his Venturas and thought it would be a great project. A lot of what you need for this project can be obtained from Jarett Harkness at www.unwindintime.com. In fact, if you have an Electric in need of TLC I would highly recommend you contact Jarett. My project watch was a decent example with a sharp case that hasn't been overly polished. It also has the proper black and gold strap that Rene Rondeau still sells. The back of the two-piece case is also in fine shape and is clearly marked Hamilton and 14K gold. The 500A tucked inside the case is missing it's battery so I have no idea if it works. The 500A replaced the original 500 introduced in 1957. The Ventura was made through 1963 so you will also find examples with the 505 movement. All models are powered by a battery that drives the balance motor. The 500A is about the same size as the Hamilton 661. The 661 is slightly smaller at 11.5 ligne vs ~12 ligne for the US-made 500A. Although the 661 fits into the movement ring that holds the 500A the case won't close with it installed. In order to close the case with a 661 inside you will need to have a different movement holder. You'll also need to relocate the feet on the dial as well as resize the holes in the hands. The first order of business for my project is to get the 661 back in working order. I actually have two donor movements so hopefully between the two I will be able to assemble one good one. On my first attempt the reassembled movement is running okay but the amplitude is low. Low amplitude can be related to the barrel sticking, a weak mainspring or something else stealing power from the gear train. I switched to the balance from the other donor movement and it also has low amplitude. Next I'll change barrels and then swap pallet forks. Looks like the pallet fork was the issue as changing that brought the amplitude up considerably. The reassembled movement (excluding the rotor) goes into the case with the new movement ring. I'll need to shorten the stem a little to bring the crown in tighter to the case. Alright, the crown is where it needs to be and the rotor is reinstalled. 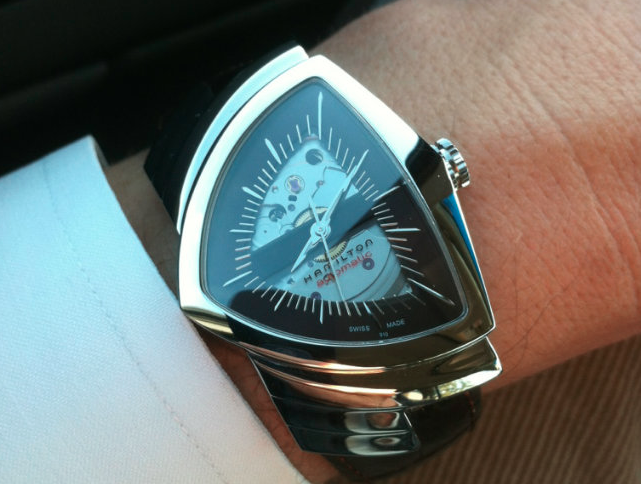 It looks like this watch was designed to use a 661, doesn't it? Thanks to the new movement ring the case back snaps on firmly and I can hear the rotor swish around as I move the watch. My friend provided a newly refinished dial with "automatic" just like the Pacermatic would have. It even says "SWISS" at the bottom, just as it should. This Ventura project watch really came together nicely. I showed this watch to my wife and daughters and they were each equally unimpressed. My son, on the other hand, thought it was very cool and Star Trek like. I guess beauty really is in the eye of the beholder. If you like the looks of the Ventura and want one with an automatic, you should check out the current Hamilton model line - as they have options in both white and black dials. Your son was right on the money. The folks at Hamilton might not have known Star Trek, but they were definitely trying to imagine the future with the Ventura. As much as I love the Art Deco Hamilton’s of the 20s and 30s, there is something about that futuristic, space age vibe of the 50s and early 60s. A skillful and very cool conversion Dan. Happy New Year! Last year I transplanted a loose Hamilton badged Eterna-Matic 1248UC (probably originally in a solid gold K series I'm guessing) into one of my dead Sea-lectric I watches. It fit great, and with a refinished dial and altered dial feet (i used International Dial) I now have what I call my 1 of 1 Sea-matic I. I'm planning on making a pacer-matic next with a 661 and a rough broken pacer i picked up. Very cool. I suspect a lot of Electrics will one day follow suit.